Today’s recipe is brought to you by Eric and Brian, Dinners With Dan‘s newest featured contributor! Thanks again to all my friends and contributors who have kept the blog up the last few weeks. I’ll have a delicious recipe of my own up tomorrow, and I’ll be back to posting regularly =)! More on why the long pause tomorrow, but I’ll do my best to make up for lost time! However, before then, I’m really excited to take Dinners With Dan from the land to the seas. Eric and Brian, Dinners With Dan‘s newest contributors, come to us from Alaska where they have worked in the restaurant industry and can’t wait to share a lot of their experiences and fantastic recipes with us. They’re starting with a recipe for Panko Fried Pacific Black Cod. Please welcome Eric and Brian to the blog and give this delicious recipe a try! 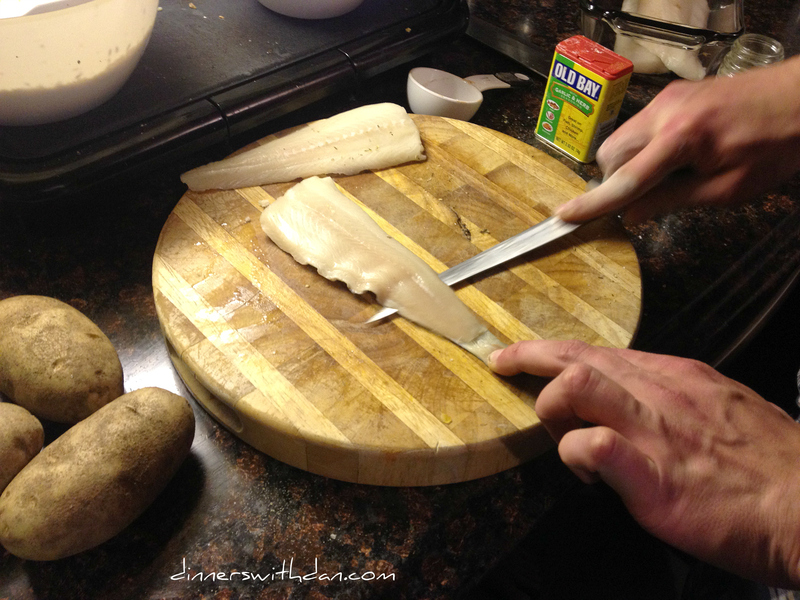 Living life Alaskan involves an appreciation for proper cooking with seafood. The delicate balance of seafood and seasoning is essential. It is fairly easy to over-season a beautiful cut of fish and finding someone who knows how to perfectly balance the two deserves respect. For tonight’s dish we have selected one of the easier species of fish to cook with in Alaska. Pacific Black Cod is a delicious deep water fish that many people enjoy along with halibut. I know most people consider halibut to be the coveted fish to catch but it can be very difficult to find a proper black cod that you can cook with. For tonight’s dinner, we have chosen several 6 ounce filets that required us to filet the skin off in order to bread them. In keeping with Alaskan tradition, we used an egg-based batter and Italian seasoning with a nice Panko breading. To complement the fish: roasted potatoes and sautéed asparagus with garlic. Mix your Panko breading and Italian seasoning in a bowl. Keep your flour in a separate bowl as you will be dipping the filets in a specific order for an ideal coating. Whisk in a large bowl your eggs and let stand. Dip your filets in the following order; flour, egg, panko. While you are preparing your fish, chop the potatoes and season to taste. We added some extra virgin olive oil to give the potatoes a nice crisp once they are done in the oven. In a large skillet, fill your pan with approximately ¼ to a ½ an inch of oil and heat at medium heat. 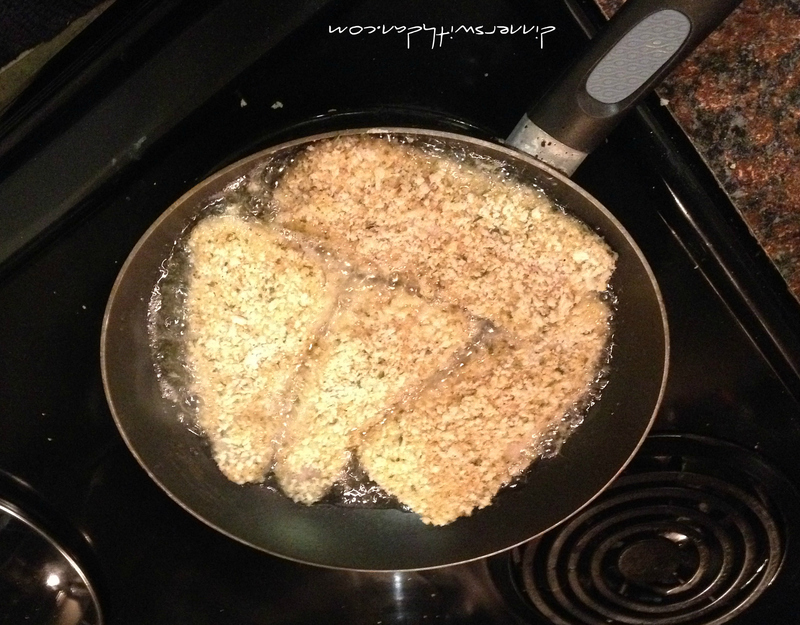 Once up to temperature, place your breaded filets into the pan and let cook until golden brown on both sides. While you are cooking your filets you can begin preparing your asparagus for sauté. Mince your garlic and begin warming a large skillet for your asparagus. Use enough oil to coat all of the asparagus you plan on using. Once up to temperature, you can add your garlic and asparagus at the same time and sauté until tender with a fork. By now your potatoes should be almost ready to come out of the oven. If the skins are a golden brown, and you can easily stick a fork in a piece, you may pull them out and let them cool down for a few minutes as they will be extremely hot. The most important thing is to make sure that your fish is not overcooked. To check this, simply take a fork and flake one of the edges. If it is tender and flakes easily your fish is ready to serve. The potatoes should take no longer than 20-25 minutes. Total cooking time will vary depending on how long it takes your oven to preheat. Once everything is on the stovetop, you are looking at about 15 more minutes before you are ready for plating. After a long day out fishing or hiking, a nice warm meal is always nice to come home to. This easy to make meal will please even the pickiest of eaters. It is healthy and delicious not to mention the ingredients (assuming you have most of the spices at home already) should only set you back around twenty dollars. There is something about baked dishes in the fall that always seem to hit the spot after a hard day’s work. Thanks so much for this recipe you two! I can’t wait until your next post! As always, if you feel inspired to make this delicious recipe, let me know how it goes! Tweet me, comment below, or post on the Dinners With Dan Facebook page! 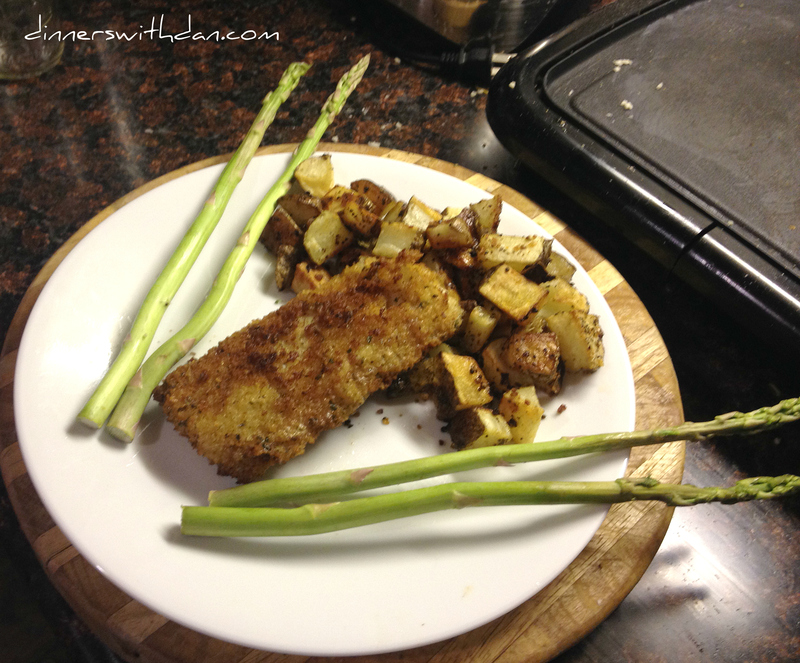 This entry was posted in Dinner, Uncategorized and tagged Alaska, Asparagus, Black Cod, Bread Crumbs, Fish, Panko, Potatoes. Bookmark the permalink. Aunt Jo’s Cheesy Italian Chicken before going into the oven. Aunt Jo’s Cheesy Italian Chicken. Tomatoes, onion, and garlic cooking down. Cherry tomatoes stuffed with olive oil, mozzarella cheese, and topped with basil. Always better with butter and honey! Like Dinners With Dan on Facebook! Enter your email address to follow Dinners With Dan and receive notifications of new posts by email.